With Paddy’s Day upon us and with Ireland hoping to help Brian O Driscoll to sign off on a wonderful playing career in an apt fashion by securing the Six Nations Championship we are doing it again at Purchase.ie. 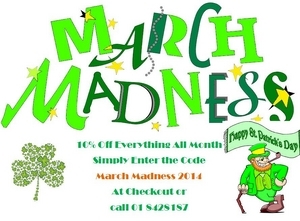 All March you can avail of a 10% discount across our entire product range by simply inserting the discount coupon code March Madness 2014 at checkout when ordering online. Alternatively you can please your discounted order with us over the phone by calling us on 01 8428187 and quoting the code. With our 300 products to choose from now is the time to shop with Purchase.ie and help reduce your energy bills and other domestic charges.